(Photo courtesy of Benjamin Zack) Pictured is Brad Mortensen, who was named president of Weber State University on Thursday, December 6, 2018. For the past decade, Brad Mortensen has had a picture hanging in his office that his 9-year-old daughter drew. In red crayon, it said “BYU” with a thumbs down next to it and “Weber” with a thumbs up. 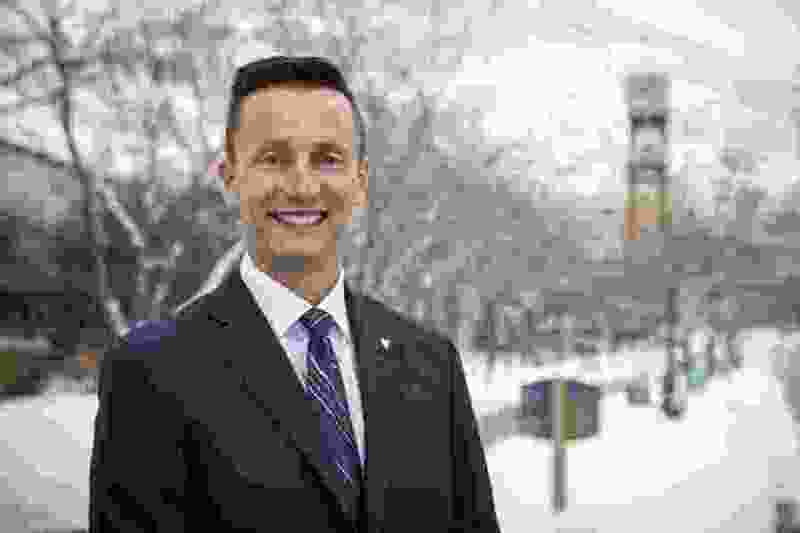 Mortensen said he looks forward to moving that frame to his new office now after he was named the next president of Weber State University on Thursday. After a monthslong search to fill the position and a week of interviews, the Utah Board of Regents unanimously voted to select Mortensen to lead the Ogden school. The decision to promote the top Weber administrator — who was previously the vice president for university advancement — was quickly met with cheers and claps, whistles and hollers from the crowd of 50 that waited in the university’s student union to hear his name over the microphone. The board seconded the motion over the applause and welcomed Mortensen to the post. Mortensen will be tasked with leading the college of more than 28,000 students in northern Utah’s Weber County with a top-tier nursing program, a competitive athletics department and a renowned track for technical certificates. He was the only internal candidate of the four finalists selected by a 21-member search committee and has worked at the school since 2004. He will step in as the 13th president early next year, replacing Charles Wight, who left the post in June after five years at the helm. Mortensen comes in at the tail end of a major shuffling of leadership at colleges across the state, with three other presidents also being named this year at the University of Utah, Utah Valley University and Westminster College. He walked onto the stage Thursday, giving Weber State’s wildcat mascot a fist bump and shouting out to his parents in the audience, who drove down from Idaho with the hope that he would be named to the position. “I’ve received so much encouragement from you,” he said, tearing up and turning the microphone to his wife, who held up the drawing from their daughter. “Brad is fiercely loyal to this school, and he is passionate,” she added. They both wore the school’s signature purple. Mortensen has been particularly involved in the community as chairman of the Ogden-Weber Chamber of Commerce and of United Way of Northern Utah. And he’s worked to create more partnerships between local groups and the university. “We realized that we need to play a more active and engaged role with the private sector, with local government, with state government in this role of economic development,” he told The Standard-Examiner in October. As vice president of advancement, Mortensen focused on how the school could expand its philanthropic efforts and help the larger community grow economically. He’s also expanded financial aid offerings at the school and pushed to strengthen connections with alumni. Mortensen previously worked for the Utah System of Higher Education, the Utah governor’s office and the Arizona Legislature. He earned a bachelor’s degree from Utah State University, a master’s from Syracuse University and a doctorate from the University of Utah. Nolan Karras, chairman of Weber’s Board of Trustees, noted that the school had a pool of 40 applicants. The search committee, he said, was looking for someone who didn’t want to come in and do “a fix-it job.” The members wanted someone who understood what is special about the school and how to continue that. The school will be celebrating its 130-year anniversary in January. Mortensen said there’s no better time to be taking the reins and giving the school a thumbs up.